At the behest of Kaikeyi, Dasaratha could not refuse to disobey the two boons give to Kaikeyi as it was the dharma of a king to implement the righteous acts and considered it as his dharma to allow Rama to 14-year exile. Sita begged to accompany him to his forest retreat. Rama told about all the hardships she must go through and the innumerable dangers in the forest. 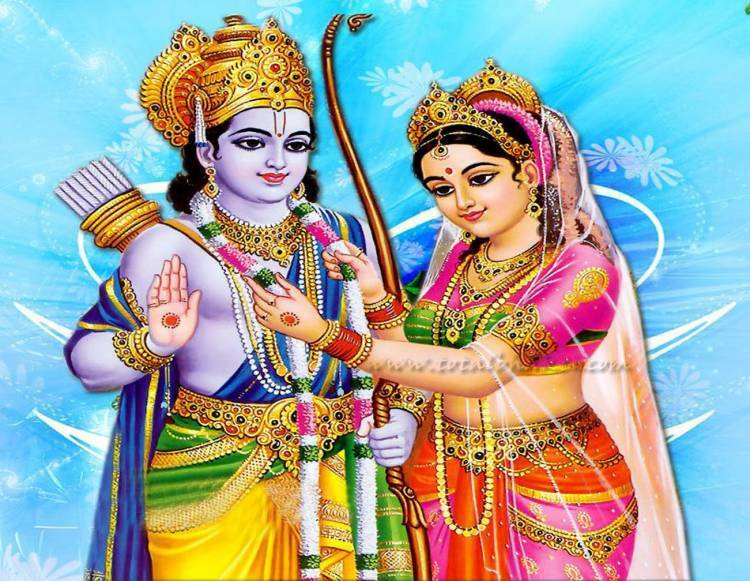 As an ideal wife, she stated, "As shadow to substance, so wife to husband," she reminded Rama. "Is not the wife's dharma to be at her husband's side? Let me walk ahead of you so that I may smooth the path for your feet," she pleaded. Then Rama, Sita and Lakshmana all went to the forest. The primary duty of a wife is to have absolute and unconditional devotion to her husband. Anasuya says to Sita: — “They that love their husband whether living in the city or in the forest, whether well or ill-disposed towards them, attain great status. Wicked, or libidinous, or indigent, a husband is a supreme deity unto a wife of noble character. (II. 117. 22-28) Further Anasuya advises by saying. “Listen, O Princess: a mother, father and brother are all kind to us; but they bestow only limited joy. Sita says to Rama at the time of the latter’s departure to forest, “O dear husband, father, mother, son, brother, daughter-in-law, all of them abide by the consequences of their own actions; it is the wife alone that shares the fate of husband... Neither father, mother, son, friends, nor her own self is the stay of a woman in this or in after-life, it is the husband alone that is her only support unto woman is preferable under all circumstances the shade of her husband’s feet to the tops of a palace, the celestial car or the excursion in the airy Path...,” (R. II 27. 4- 23) In reply to Dasaratha Sita says: “The Vina (lute) without strings does not sound; and the car without wheels does not move, -so although having a hundred sons, a woman without husband cannot attain happiness. The father gives in measure, the brother and the son give in measure, but who does not worship that bestower of limitless treasure the husband? ...A husband is a deity unto the wife.” (Ramayana II. 39. 29-31) A woman should unhesitatingly prefer the wishes of a husband. Sita’s patience, tolerance and compassion is well recognized. It is an acknowledged fact that she was born in mother earth. Like the earth she has more forbearance, tolerance, patience and compassion. Despite all the abuse we cause to mother earth, her compassion never diminishes. 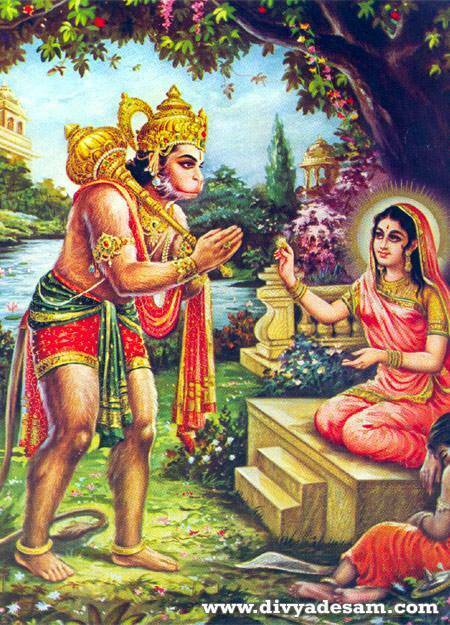 After Rama killed Ravana, Hanuman comes to Sit Devi and wanted to all her guards who harassed her. Sita calmed him down and said, "Son, these poor wretches were simply carrying out their orders. Just as you follow your master's orders with such zeal, so did they. Is it right to punish servants for the folly of their masters? Forgive them for my sake. They have shown me great lenience, and only pretended to harass me in front of Ravana. In his absence, they often comforted me and gave me hope of seeing my beloved Lord again." Hanuman was so thrilled and surprised at her loving nature and with tearful eyes, he stated, "Mother, you are more compassionate than Lord Rama. His wrath consumed the entire army of Lanka, were as you will not let me singe a single hair of these wicked women. You are truly kindness personified." Rama is considered an ideal son, ideal husband, ideal brother, ideal friend and even ideal enemy. As an ideal son, he never disobeyed his father. His respect, deference, honor and love toward her parents were unmatched. He never blamed neither his father nor his stepmother Kaikeyi. Tulasidas himself praised Rama by saying that “No father nor mother can get a son like Rama.” He never identified himself as Rama; he only identifies as Dasaratha’s son. After he broke the Lord Shiva’s bow during Sita Swayamvar ceremony, he told Janaka that, “I am the son of Dasaratha, king of Ayodhya. I cannot accept her until my parents accepts her and find her suitable for me. So kindly send your messenger to get their approval.” When Dasaratha was trying to stop Rama from going to exile, Rama said, “I cannot break my family tradition of keeping promise … If I have to do whatever action is dearer to my revered father, that action is just done in all respects even by renouncing life. There is not indeed anything of greater performance of duty than doing service to father or than doing what he commands." (II:20: 21-22). Kaushalya laments over the impending decision of Rama going to exile. She argues that mother should also be worthy of worship and should abstain from going to the forest as per her wish. In fact, she says that would not live if Rama would leave for the forest. It is better for her to starve to death. Rama said that he must obey the promise Dasaratha made to Kaikeyi. He gave the examples of Parasu Rama who slayed his mother and sage Kandu who killed the sacred cow to obey the commands of their fathers respectively. Rama said that there are many others who complied with the commands of their fathers in accordance with the prevailing custom. He said to mother Kaushalya, "I am not able to violate my father's words. I am bowing my head and asking your favor. I shall have to go to the forest"(2:21:29). He also informed that, "I cannot do otherwise than acting in accordance with father's words, the prevalent practice on earth. There is no deprivation indeed for anyone who complies with father's commands." Kausalya, as devoted wife, would not do anything against his promise. She would not allow her husband to be insulted by anybody. Her royalty to her husband was irrevocable. Even though she became emotional and upset at the prospects of Rama going to forests, she regained her composure by invoking blessing on Rama. 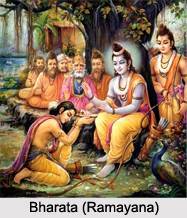 Consequently, Rama could fulfill the father’s command without ever questioning. 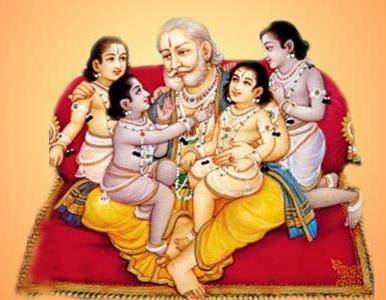 Rama sacrificed the kingdom and went to 14-year exile to keep the family tradition. Rama never harbored any ill will toward Kaikeyi in spite of her wish to send Rama to forest for 14 years because of the promise she received from King Dasaratha. After Rama killed Ravana, Lord Shiva tells him that he is an incarnation of God. He is born only to remove the thorn that was piercing the earth. Then Lord Shiva asked Sita, Rama and Lakshman look into a heavenly airplane where they see King Dasaratha, who acknowledges their great achievements and blessed them affectionately. Dasaratha said, "Rama, being pleased with you, you will attain religious merit and extensive glory on earth, as also heaven and excellent power O knower of righteousness!" When Dasaratha remembers the pain that was imprinted in his heart with the words of Kaikeyi that send him to exile, Rama said, “Sir, you know all the laws of justice and fair play. When queen Kaikeyi asked for my exile, you were angry with her and with her son Bharath. Please change your mind about them, for Kaikeyi had always loved me and brought me up as a child and now Bharath rules the kingdom as a mere representative of mine.” Dasaratha accepted his wisdom and praised his magnanimity. Rama is an embodiment of dharma. Despite all the difficulties he encountered in search of Sita, undergoing many discomforts in the forests, and humiliation of Sita being kidnapped, Rama never strayed away from dharma. After he entered Lanka by crossing the bridge built by Vanara Sena, Rama was gracious in allowing two spies sent by Ravana to even inspect his army and its deployment. Rama then asked the spies to carry the message to Ravana thus: “Ravana, you are a great devotee of Lord Shiva. Still, you committed the unforgivable folly of abducting Sita. It is even now not too late to repeat and seek my pardon. I give you time till tomorrow morning. If by then you do not come to me to beg my pardon, you will be the one responsible for the destruction of your city and your people.” Ravana was outraged at the assessment of Rama’s magnanimity and description of all the prowess of Lakshman, Angadha, Sugriva and others. Ravana misunderstood Rama’s forgiveness and dharmic nature as a weakness. He denied the conciliatory message sent by Rama. During the war, Rama could strike the elaborately carved headpiece that shielded all his ten heads and make Ravana defenseless. His head armor was shattered to pieces. 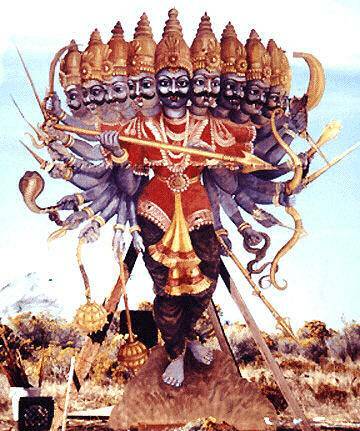 Ravana was defenseless without the armor to his ten heads. The arrow that made Ravana defenseless returned to Rama’s hands. Lakshmana asked Rama, “Why did you not …. ?” Rama replied, “One does not kill a foe who us disarmed and prostrated before oneself on the field of battle, Lakshmana. It would be dishonorable to kill Ravana thus.” Lakshmana questioned as to, “Why should we show him any honor when he fights without honor.” Rama replied, “Because we are Dasaratha’s sons, Shishyas of Brahma rishi Vasishta and Vishwamitra. Children of Kausalya and Sumitra. Kings in waiting of Ayodhya, mightiest of Arya nations. Because we are Kshatriyas, bound by the code of the warriors. Because we are followers of Dharma.” Despite all the grievous crimes committed by Ravana, Rama asked him to return in the morning at sunrise to complete the war. He spared the life of Ravana even though Rama had very opportunity to kill him. Finally, when Ravana was attacked and was on deathbed, Rama asked Lakshman, “Go to Ravana quickly before he dies and request him to share whatever knowledge he can. A brute he may be, but he is also a great scholar.” Ravana said that the most important lesson of life is that you must avoid engaging in bad action as much as you can and you must do good action without any delay; sooner the better. By following this rule, you can save not only yourself but many other people from being damaged. Always trust and heed the advice of your ministers. Do not think that you are always winner even if you are winning all the time. As a king, you must suppress greed as soon as you realize if you want to do good to the people. Do not be attached and be slave to your senses. One needs to put them in proper place, otherwise they will lead you to your destruction. He guided him to have always good relations with charioteer, cook, gatekeeper and his brothers, because those are the persons who can harm you most. He advised Lakshmana never to underestimate strength of his enemy, a mistake which he made. He asked Lakshmana to always believe in astrology and movement of stars which can never be wrong. He told him to trust a minister who criticizes his actions. Similarly, Rama showed his benevolence toward Ravana even after he was killed. It was time to attend to complete the funeral arrangements. Rama spoke to Vibhishana as follows: "Let the obsequies of your brother be performed and let these crews of women be consoled.” Vibhishana reacted by saying that he is not obligated to perform the obsequies to his brother because he killed many human beings, kidnapped Sita, relinquished the virtuous nature, became slave to his sexual desires and killed his own kin and kith. Hence he should not be respected for all his evil acts and people may think of these evil acts as good acts, if any respect is given to his body. Rama acknowledging the demonic qualities of Ravana, Rama said, “Hostilities end with death. Our purpose has been accomplished. Let his funeral rites be performed. According to the prevailing tradition, Ravana is eligible to get the last rites on his dead body from you. You will also become fit for glory." Following the advice of Rama, Vibhishana completed obsequies to Ravana, his dead brother. All major characters in Ramayana are upholders of dharma. All four brothers are the supreme example of the highest values. Valmiki called Lakshmana as the other self of Lord Rama and also described him as “Rama’s right hand.” They are inseparable and are considered as bimba and pratibimba – they are reflection of each other. Lakshmana was considered the symbol of loyalty, faith, dedication, selfless service, sacrifice and commitment toward his brother Rama. He always served Rama and Sita with reverence, obedience and devotion. When Rama decided to honor his father’s promise, Lakshmana was furious, fuming, fretting and enraged. 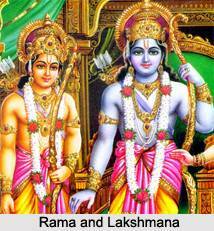 Addressing his mother, Lakshman said, “Mother, my brother Rama is not guilty of nothing. All this transpired from our father Dasaratha’s weakness in youth… I will not stand this nonsense. I cannot remain idle in when the kingdom that rightfully belong to Rama is being snatched away from him.’ He wanted to punish those responsible for this sad state of affairs. Lakshman told Rama that he cannot accept Kaikeya’s wish of sending him to forest. He cannot see that Ikshuvaku dynasty is insulted. He was even ready to lay down his life to repair the injustice being done. He was ready to proceed to take vengeance against Kaikeyi. Rama consoled him by saying that, "Oh, Lakshmana! I know your highest affection towards me, your heroic valor, your strength and your unassailable splendor … Righteousness is the best of all qualities in the world. Truth is established in righteousness. Even these best words of father are enjoined with righteousness. One who follows righteousness, does not waste his promise given to one's father or mother or Brahmana. I cannot transgress my father's command. On the word given by my father only, Kaikeyi instigated me to go to the forest. Hence, leave this mean mentality of military heroism. Observe righteousness and not rudeness. follow my perception.” (Ayodhya Kanda 21: 38, 40-42). Lakshmana decided follow Rama and spend his life in the exile leaving behind his mother and newly married wife, and forsaking all the luxuries of a kingdom with no hesitation. He considered Rama as his brother, friend and a father. Rama was very fond of him and could count on him to assume the responsibilities accorded to him. When Lakshmana fell unconscious in the battlefield, Ram lamented by saying the “If I were to search in the world, I may get a mother like Kausalya and a wife like Sita, but not a brother as noble as Lakshmana. 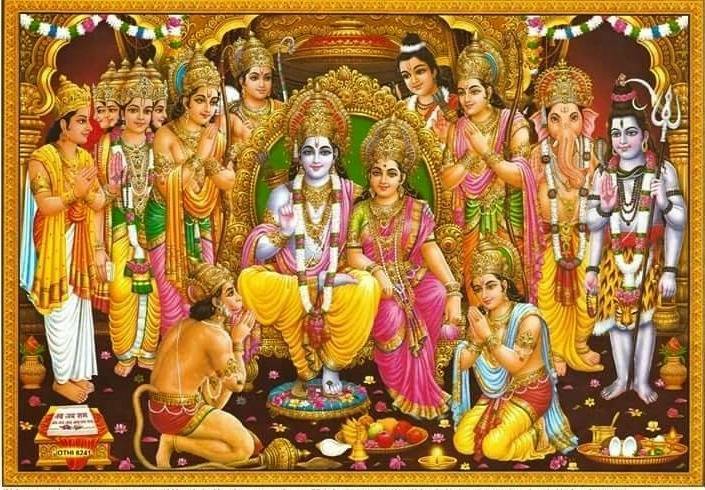 What is the use of life without Lakshmana?” And, Rama said, “Lakshmana is the breath of my life, a brother like him never been available for anyone else on earth.” Lakshmana's sacrifice and faithful commitment to his brother Rama are shining examples for mankind of all ages. His determination to serve Rama was commendable and extraordinary. His loyalty to his brother was exemplary. On the very first night of the exile, when Ram and Sita retired for the night in the forest, Lakshman kept a watch on them. As expected Goddess Nidra (the Goddess of sleep) approached Lakshman that night. But he begged her to excuse him for next 14 years so that he could carry out his dharma unconditionally in protecting Rama and Sita without any hurdle. Nidra commanded that someone else must sleep to maintain balance on his behalf. Lakshman asked her to consider his wife Urmila to sleep for those 14 years. The goddess was impressed by his devotion. Thus, Lakshmana’s unwavering responsibility to safeguard his elder brother for the rest of the exile was very impressive. Nidra went to the Ayodhya Palace and asked Urmila if she would take up Lakshmana’s sleep, which she gladly did. Bharata was away when Rama decided to leave Ayodhya as per the wish of his stepmother Kaikeyi. Her plan was to make Bharat as the King of Ayodhya since Rama left for the forest for 14 years. When Bharata learned what his mother had done, he was furious at his mother and in fact he even banished his mother from Ayodhya. He went to the forest to meet Rama and request him to come back. His love for Rama was unshakable, deep and unmatched. Tulasidas described Bharata’s unwavering faith in Rama. Bharata said, “I do not want wealth, nor righteousness, nor the fulfillment of my desires. I do not even want liberation. The only boon I ask is that in life and after life I have pure love for the lotus feet of Shri Rama.” He even reminded Rama that "The eldest must rule. Please come back and claim your rightful place as king." Rama refused to go against his father's command by saying that, "Our father the King gave you kingship after him and he ordained for me life in the forest. What right have we to alter or reject his plans? Far from being wrong, it is your duty to rule the land. And I too shall do my duty … I cannot possibly disobey my father's word. You will please me by not persisting in trying to persuade me. Satrughna is there to help you in ruling, as Lakshmana is here to help me in forest life. With Lakshmana by my side, I lack nothing. Let us all four do our father's will." Then Bharata took his brother's sandals and said, "I shall place these sandals on the throne as symbols of your authority. I shall rule only as regent in your place, and each day I shall put my offerings at the feet of my Lord. When the fourteen years of banishment are over, I shall joyously return the kingdom to you." Rama was very impressed with Bharata's selflessness. As Bharata left, Rama said to him, "I should have known that you would renounce gladly what most men work lifetimes to learn to give up." There is a universal appeal among many nations across the globe. The eternal values related to the day to day living, relevance of dharma, democratic principles, brotherly obligations, parental obedience, responsibilities of husband and wife, sagely advices, Hanuman’s selfless service, patience and tolerance, rules guiding the warfare, and others have become the source of inspiration and are being adopted to enrich the respective cultures. Ramayana travelled to numerous countries such as Malaysia, Indonesia, Cambodia, Thailand, Vietnam, Laos, Colombia, Burma, Philippines, Fiji, Mauritius, Bali, Mexico, Trinidad, Guyana, Surinam, South Africa, Japan, China, New Zealand, Australia, Britain, Belgium, Holland, USA, Canada and may other countries. What is that message that resonated in the hearts and minds of the people. How can one win the Lord Rama’s grace and blessings? He admonishes people to follow the path of dharma with devotion that he himself followed: “I am won by the conduct of a man as depicted below, brethren. He who has no enmity or quarrel with anyone and is devoid of hope and fear - to such a man all the quarters are ever full of joy. Undertaking nothing (with an interested motive), without home, without pride and without sin, free from wrath, clever and wise, ever loving the company of saints and accounting the enjoyments even of heaven as well as final beatitude as no more than a blade of grass, tenaciously adhering to the cult of Devotion but avoiding bigotry, and giving up all sophistical reasoning.” (Ramayana, Uttarakanda:46). This kind of universal message permeated the people of all the countries. "There is not in the whole range of Sanskrit literature a more charming poem than the Ramayana. The classical purity, clearness and simplicity of its style, the exquisite touches of true poetic feeling with which it abounds, its graphic description of heroic incidents, nature's grandest scenes, the deep acquaintance it displays with the conflicting workings of the mind and most refined emotions of human heart, all entitle it to rank among the most beautiful compositions, that have appeared at any period or in any country."